Review date: 11 May 2003. There is nothing, nothing I tell you, which makes me more excited than getting a sample of a new kind of thermal transfer compound in the mail. Heatsink grease, baby. Ain't nothin' like it. I was, therefore, beside myself when these two natty little 2.7 gram syringes of Arctic Silver's latest product turned up. OK, actually I wasn't. In truth, I was pretty underwhelmed. While other people's opinions may differ, I've never found a fancy premium heat sink goop that works much better than ordinary generic put-it-on-your-nose-to-avoid-sunburn zinc oxide paste. Don't get me wrong; premium goops do have advantages. They're likely to last longer, especially at high temperatures, without drying up or separating or turning into porridge. Premium goops may also be easier to apply, not least because they're likely to come in a syringe, not a crinkly little plastic bag. Premium goops also make the user feel more 31337, especially if the user covers the entire CPU, its socket, and both sides of the motherboard with the stuff. I have, in the past, held forth on the subject of the relative merits of different thermal goops at some length. I've checked out some goop alternatives, as well. I'm sorry - . Outrageous French accent optional. It's the latest from the Arctic Silver labs, it comes in a nice little syringe with a low-mess cap and a design that ought to let you actually use more of the goop in the syringe without taking it apart and digging the last bit out with a screwdriver, and it (and I quote) "uses a high-density layered composite of five unique shapes of thermally conductive aluminum oxide, boron nitride and zinc oxide sub-micron particles to maximize particle-to-particle contact area and thermal transfer". I needed a CPU cooler to test the new goop with, of course. Conveniently, one had turned up in the same mail delivery that brought the Ceramique. 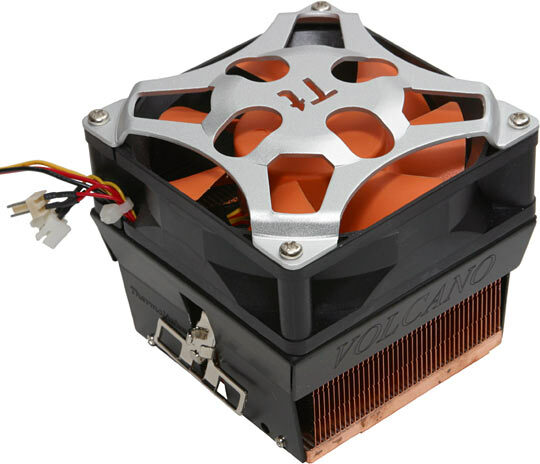 This macho looking object is a Thermaltake Volcano 11+. Not just a Volcano 11+, either; this is the Volcano 11+ Xaser Edition! Plus! Turbo R-Spec! Actually, the 11+ that Thermaltake sent me is even more over-the-top than the one described on their product page, because it's got three speed control devices for the look-at-me 80mm orange fan that sits atop the all-copper thin-fin heat sink. Here are two of the controllers. They each allow you to alter the fan speed by the revolutionary method of twisting a knob. One of the controllers is built into a standard rear expansion slot cover (except shiny, and gold! ), so you can control the CPU fan speed with a knob on the back of your computer. This controller comes with all Volcano 11+ Xaser Die Cut Foil Stamped Editions. The other controller seems to be new. 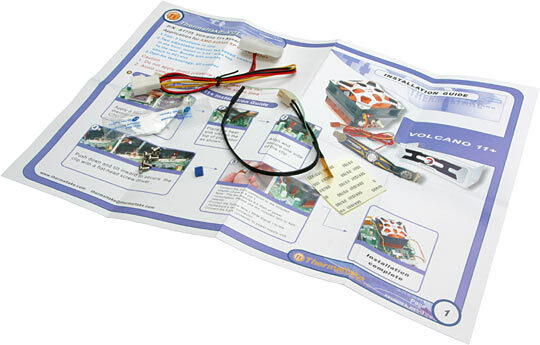 I haven't seen it mentioned before (in, for instance, the reviews here, here, here, here and here), and it's not included in the Volcano 11+ packages I've seen on sale in the stores so far. It's also not mentioned on Thermaltake's product page for the cooler. This new controller is built into a 5.25 inch bay cover, with standard mounting screw holes, so you can put the fan speed knob on the front of the case. I'm not entirely sure how useful this is. How often do you need to adjust your CPU cooler fan speed, after all? But if you do want such a feature, I presume you'll be able to get it, as soon as the two-knob version of the Volcano 11+ makes it into the stores. Both knob controllers use a simple logarithmic 9.12 kilo-ohm potentiometer; you plug them into one of the two-pin headers coming out of the fan. Turn the knob all the way to the left and you get about 1300RPM, and a fan that's functionally inaudible. Turn the knob all the way to the right and you get about 4800RPM, and a good old fashioned noisy overclocker's fan. Why spend big bucks on a low-noise sound card when you can just drown out the hiss and buzz of a lousy one with the airflow racket from your PC's case? Brilliant! 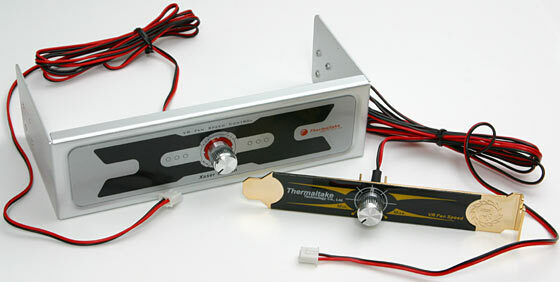 Previous speed-controllable Thermaltake coolers have had potentiometer controls as well, but they've used little tiny pots that're made to be installed on a circuit board, and are just hung on the end of a wire in Thermaltake's application. The proper knobs on the Volcano 11+ controllers are much easier to adjust than a teeny-pot sticking out of some handy hole on the back of your case. Along with the two knob controllers, this Volcano 11+ came with the rest of its standard retail package. 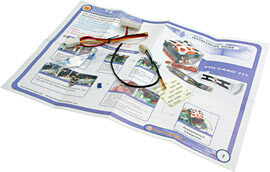 Neat double sided instruction manual. Little bag of thermal grease. Mounting screws for the knob controllers. A little jumper block you can stick on the speed controller pins if you just want the fan to spin at full speed all the time. A passthrough four-to-three-pin power adapter with tacho-wire-only lead, so you can power the fan from your PC's PSU while still monitoring its speed using a motherboard fan header; running a high power fan like this from a motherboard header is not a great idea. And the third speed controller. The third controller is a slim thermal sensor, which you can stick to some likely spot on your CPU or heat sink with a piece of the provided square of tape. It plugs into the second two-pin header coming out of the fan. When the sensor's below 20°C the fan runs at minimum speed; it ramps the fan speed up to maximum over the 20 to 55°C range. Before I gave the Ceramique a whirl, I wanted to establish a baseline score with some plain grease. So I assaulted every part of my CPU-simulating heater (read about it at the start of my giant CPU cooler comparison) with the gene-damaging solvents that've made me the man I am today, to remove all traces of previous greases. Then I whipped out the most generic not-made-by-Dow-Corning zinc oxide paste I could find. I normally use premium thermal goop when I'm testing CPU coolers; not this time. This stuff had to be bad, because I'm pretty sure it came with this cooler. At full power, with this questionable paste, the Volcano 11+ scored 0.58 to 0.59°C/W over multiple test runs. This is an OK score, but it's not at all impressive for a large all-copper cooler with a noisy fan. Turning the fan down to minimum speed lousied up the score, as you'd expect; the Volcano now managed only 0.87°C/W, which is not nearly good enough for modern way-over-50-watt CPUs. At minimum speed, though, the 11+ is a practically silent cooler. It'd be perfectly suitable for use in a living room computer, powered by a Tualatin P-III or something, that's not allowed to be noisier than the DVD player. OK. Time for another instalment of Fun With Cleaning Products. And on to the Ceramique. Ceramique is sticky stuff; if it were epoxy, it'd be telling you that you didn't have much part-positioning time left. This is not a bad thing in itself, but it does make it a bit difficult to spread the goop on a chip. If you follow Arctic Silver's instructions and have a small contact patch processor, though, you won't have to spread it in the usual way. In order to accurately simulate the behaviour of a person who hadn't read the instructions, I spread some Ceramique all over the top of my CPU simulator, slapped the freshly cleaned Volcano 11+ on, and tested it, with the fan at full speed. It scored 0.55°C/W, a worthwhile improvement over the lousy-grease I'd tried before. Next, I did the full official-instructions routine. First, I took the grease that'd been squished onto the bottom of the heat sink in the first Ceramique test run, spread it over the contact patch area as per the instructions, then wiped it off with a lint-free cloth. This is to fill the "microscopic valleys" in the bottom of the sink, which may otherwise retain air when you put the sink down on top of a CPU. As far as I can see from my previous real world testing, doing this is one of those things that may help in a much more demanding application than CPU cooler installation, but won't actually improve J. Random Overclocker's situation noticeably. No matter, though; I did it. Next, I cleaned the heater contact patch, and gave it a blob of grease in the middle, ready to be squashed out by the CPU cooler, as per the Ceramique instructions for small contact patch processors. I attached the cooler to the CPU simulator and wiggled it to distribute the grease. And I ran the test again. And it scored 0.55°C/W again. So following the Ceramique instructions does not appear to work any better than greasing up the old fashioned way. It isn't difficult, though, and doesn't use much more grease, so you might as well go with the flow and do it. It is alleged by Arctic Silver that "the heat from the CPU lowers the viscosity of the compound to enhance the filling of the microscopic valleys and ensure a minimum bond line between the heatsink and the CPU core", so I thought I'd better give the system a baking and see if it performed any better afterwards. Accordingly, I turned off the Volcano's fan, ran the heater temperature way up, and kept it there for two and a half hours. I used some highly scientific tweaking of my bench power supply's knob to keep the heater temperature around 106°C. With the heater at this temperature, the edge of the base of the heat sink was only about 18°C cooler than the probe inside the heater. That speaks well of the thermal conductivity of this heat sink. The thermal probe inside the heater is close to the element, so it tends to read high (all of the numbers this simulator delivers are rather cruel); getting within 20 degrees of the heater temperature at the edge of the heat sink (albeit without the fan running) is quite impressive. Anyway, after two and a half hours baking away at a somewhat higher temperature than any CPU could be expected to produce (CPUs stop working at around 80 to 90°C core temperature), I turned the fan back on. And the system settled down again to the same reading it had before. Actually, this time it read 0.54°C/W, but only barely. Taken to three decimal places, the readings for the first and second tests were actually 0.546°C/W and 0.544°C/W, respectively. My testing rig doesn't have enough real resolution that these results can genuinely be said to be different. Dedicated as I am to the highest scientific standards, I wanted to see whether the awful-grease I'd chosen for the initial tests really was awful, or whether there was room for improvement if I used, say, the little bag of grease that came with the Volcano 11+. That's supposed to be Dow Corning type 340 silicone goop, but the bag I got with my Volcano 11+ said it was made by Sil-More of Taiwan. So maybe it wasn't that good after all. Never mind. I flipped a few more bits in my chromosomes with further applications of Uncle Schmalbert's Hose-On Metal Cleaner and Offspring Improver, and then had at the heater assembly with the bagged grease. This stuff went on like your regular medium quality white thermal goop; nice and smooth, like thin PVA glue. This does suggest that it's going to go chalky and/or separate out over time, but the nasty stuff I tried for the first test felt as if it was half way there already. With this grease, lo, the Volcano 11+'s score settled down at 0.58°C/W again. The same as it managed with the lousy white grease, and still noticeably worse than its score with Ceramique. Regrettably, I could think of no excuse to set anything on fire for this review, but I didn't see any reason not to give this goop a bit of a baking, too. I turned off the fan and let the heater go at full power; I stopped it only when the temperature at the edge of the heat sink was over 100°C. The evening was a bit chilly, so I enjoyed the hot breeze it blew when I turned the fan back on. Wiggling the heat sink now felt noticeably grittier than it had when the grease was fresh; the heat had baked out some of the carrier fluid. This is a half-decent simulation of what'll happen to this grease after a few months of normal computer use. Lose all of the carrier fluid in your thermal compound and it'll be a powder, which won't deal well with small movements of the CPU cooler thanks to fan vibration and moving the computer around. This is bad. Lose just some of the fluid, though, and the compound should work better. The result? 0.56°C/W. Not quite as good as the Ceramique managed, but near enough as makes no real difference. Given the imperfections of my CPU simulator, I couldn't swear in court that there was any thermal difference at all between Ceramique and the baked-in stock grease. I'm pretty sure there is, though; the not-statistically-significant three-decimal-places scores are more than 0.01°C/W apart. What's it all mean, then? 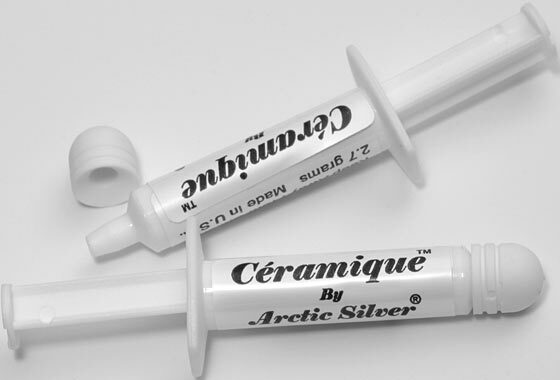 Arctic Silver promise that Ceramique will give you "2 to 10 degrees Centigrade lower CPU full load core temperatures than standard thermal compounds or thermal pads". That seems fair enough. I think you're likely to see improvements closer to the 2 degree end of the scale than the 10 degree end, and users of low power CPUs aren't likely to see any difference at all between properly applied standard grease and Ceramique. But the stuff does, I think, do something. That's not surprising; I've previously established that at least some premium thermal compounds can be expected to perform a bit better than plain white grease. But it should be noted, again, that the thermal performance difference we're talking about here is not large. By simply getting the installation of a CPU cooler wrong, I can easily create a performance difference exceeding what Ceramique showed over the lousier ordinary grease. And so can you. It's easy! Putting on a big blob of grease instead of a thin layer is surprisingly ineffective at messing up the thermal contact - the excess squeezes out quite well over time, if the CPU cooler's got a reasonably strong clip. But if you under-apply the grease, or slide the cooler around while installing it so the grease gets wiped off the contact patch, or manage to whip the grease into a foam with artfully poor use of whatever you're using to spread it, or get a few foreign bodies stuck in the grease, you can add a degree or three to your CPU temperature very easily. I've made these sorts of mistakes many a time while reviewing CPU coolers. That's why I do multiple tests, to make sure my own deity-given incompetence does not stand between my faithful readers and the truth. Thermal performance, however, isn't the only reason to buy premium goop. Its physical resistance to drying and separating and whatever other disasters may befall does matter, especially if you're the kind of computer user who isn't upgrading their processor and putting on fresh grease every two months. So Ceramique meets with my approval. A miracle, it isn't; worth using, it is. Check out Arctic Silver's where-to-buy page here to find your local dealer or distributor. Also, the Volcano 11+ is a good piece of gear. The knob speed controllers are pleasing (just the back panel one will do nicely, if you ask me), the thermal probe speed controller also works, and the whole thing looks good. The stamped-aluminium finger guard on the fan probably occludes air flow somewhat, but it looks so tough you can forgive it. The Volcano 11+ should also be available in an awful lot of computer stores; Thermaltake products are easy to find. So pretty much wherever you live, you shouldn't have to order it from a far distant land. When I first wrote this review, Aus PC Market sold the Volcano 11+ for $AU57.20 delivered (however, they don't sell it any more). Not a bad price for a big flashy cooler that actually works. The Aus PC Volcano 11+ version was without the 5.25 inch bay knob speed controller (the same goes for everybody else, as far as I know). The version that comes with both knob controllers will probably cost a bit more, if and when it turns up. Big deal, though; the single-knob version is fine. Volcano 11+ Xaser Edition kindly provided by Thermaltake. Arctic Silver Ceramique kindly provided by Arctic Silver. Aus PC Market don't sell these products any more (click here to see other thermal transfer compounds they're currently selling), but you can still try a price search at DealTime! My original thermal compound comparison, complete with guest appearances by toothpaste and Vegemite, is here. Grease, however, is a pain to work with. This stuff's better.